Cornerstone content forms the foundation of your site. If you write a couple of authoritative articles about your chosen subject and keyword, you can link all your other posts to these articles. In doing so, you greatly enhance the chance of these articles ranking in the search engines. Build your site as the ancient Egyptians built pyramids. Block by block on a solid foundation. Yoast SEO 4.6 adds another new feature to help you create your site structure. As you know, cornerstone content is the most important content on your site, but until now we didn’t have an option to mark these as such. 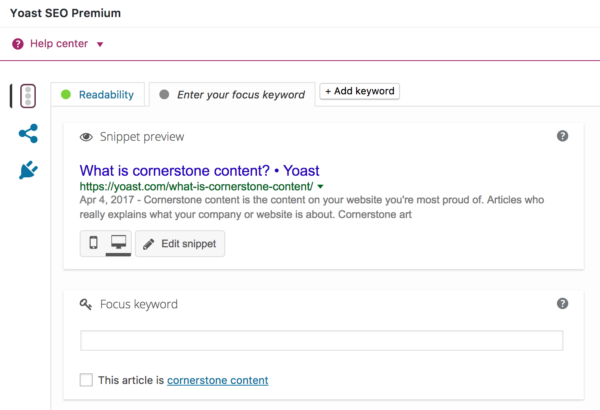 In today’s release of Yoast SEO 4.6, you’ll find an option to indicate that the selected article should be treated as a cornerstone article. This way, the article receives priority over a regular article. These articles are analyzed more thoroughly to increase the chance of them popping up as must-link articles. You can now mark your articles as cornerstone content. We’ve also included a visual aid in determining whether an article is cornerstone content. These links will appear above the list of regular suggestions the internal linking tool in Yoast SEO Premium makes. 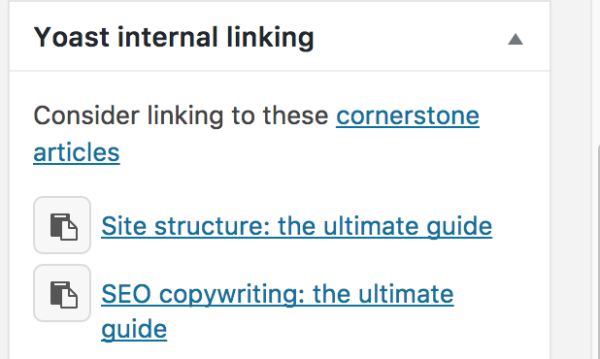 Now, you only have to start marking your cornerstone articles as such, and they will rise to the top of the suggestion list so you can easily link to them. Working on your site structure has never been easier. The internal linking tools highlights cornerstone articles. There’s a lot more to say about cornerstone content, so Marieke took the opportunity to dive deeper into the subject. Read her article and start working on your cornerstone content! It’s also possible to see your cornerstone articles in the post overview. Besides the new cornerstone content feature, we’ve mostly fixed some bugs. In addition to that, we’ve improved some language strings, enhanced compatibility with WooCommerce 3.0 and made some changes in the configuration wizard, so it’s easier to understand for everyone. As always, happy updating! And if you want to see all the changes we made in this release, you can find the complete changelog over on WordPress.org.